In addition to hundreds of different types of rifle, handgun and shotgun ammo, Pat’s Archery and Outdoors’ website also carries value-size bulk ammo to accommodate the most avid shooters. That's because as those who spend countless hours pursuing game in the field or perfecting their craft on the range know, there's just no time to come up short when you're ready to reload. The average box of ammo includes 20 - 50 rounds. If you're planning just one or two hunting trips this season, a casual trip to the range or a minimal setup for self-defense, that quantity may serve you well. However, more serious hunters and shooting enthusiasts use more ammo, and that means it's easy to run out when it's least convenient. Bulk ammo, on the other hand, ensures a ready stock at your fingertips. And the advantages to bulk ammo don't end there. You may find buying in bulk to be more cost-effective, and those savings can translate to extra money at the end of the hunting season or a new piece of shooting gear to round out your equipment. 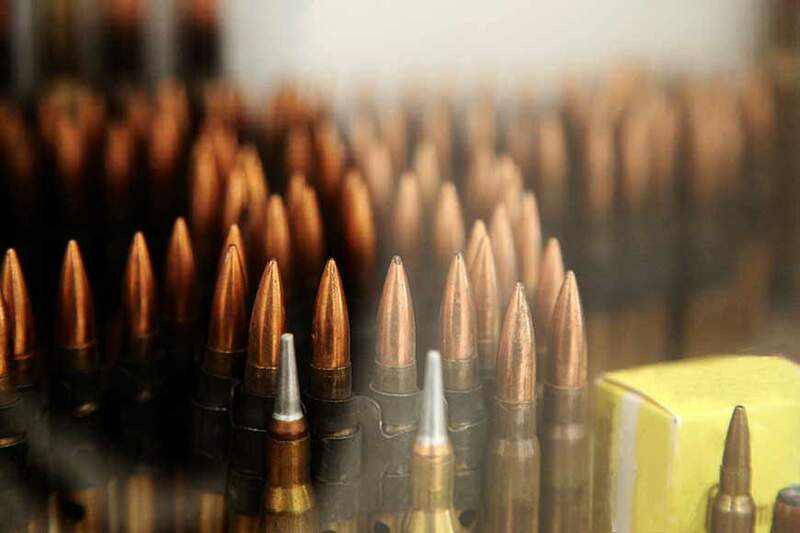 Purchasing in bulk also eliminates the worry of not finding your required caliber when needed, which is especially relevant for less-common calibers. Luckily, Pat’s website carries a large assortment of bulk ammo to keep your supply stocked. Our inventory features a variety of materials, styles and performance specs to choose from, so you can enjoy match accuracy every time you fire. For your convenience, we also carry all the top brands, such as Remington and Winchester, so you can feel confident that you’re getting premium-quality products. And it doesn’t matter whether you need .22LR, .45 ACP or a different caliber, you can find the ammunition you require at Pat’s. Bulk ammo clips are also available to accommodate your preferences. Since you’ll probably be using your gun a lot with a bulk pack of ammo in your collection, it might be time to stock up on other gear and accessories, too. Pat’s Archery and Outdoors’ website also offers a full range of hunting equipment, like blinds and calls, plus all the accessories you might need to get your gun ready for action. Browse through our selection of scopes, cleaning tools and more, so that you’ll be fully prepared with quality gear. With a complete inventory of products online, it’s easy to shop from home and get everything you need all in one place. Pat’s Archery and Outdoors also has a physical store located in Jasper, AL for anyone who wants to check out bulk ammo in person. Have questions about purchasing bulk ammo? Call us at 205-387-7678 or contact us online for more information.